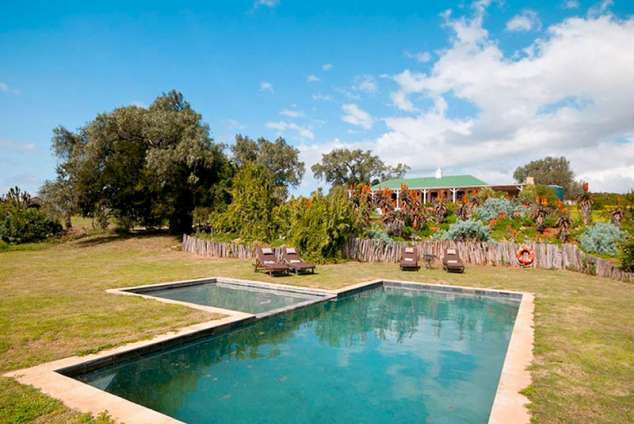 Leeuwenbosch Country House - Paterson Accommodation. The fifth generation of the Fowlds family welcomes you to their old country home which was built in 1908. The manor house is furnished with a combination of antiques and the luxuries of modern living to optimise comfort during your stay. Your luxury suite is a short walk down the passage to the guest lounge, where gatherings for High Tea commence each afternoon before your game drive. Take a walk across the indigenous gardens to the dining area, situated in a separate building, where all meals can be enjoyed with new friends and travelling companions. Our Country House rates are inclusive of accommodation, meals, game drives and selected house beverages. Light snacks in the form of delectable sweet and savoury pastries are provided half an hour before the game drive is to commence at the main lodge. Bottled water, beverages and light snacks such as biltong are provided en route and the vehicle will stop in order for guests to alight and enjoy a sundowner at sunset. Dinner may consist of either a three course meal served by the crackling fireplace in the warm atmosphere of the dining room or an informal bush braai/barbecue served under the stars. Barbecues are presented in a buffet style with a spread of salads and/or hot vegetables and barbecued meats (chicken, beef, ostrich, or venison). After enjoying dinner, guests are invited to socialize until the small hours of the morning or to retire to the comfort and luxury of their suite. Whatever the preference, they will awaken to the chorus of an African dawn and ready for another day of adventure! Guests are served coffee, tea and cereals and yoghurts in the manor house half an hour before a game drive commences. The duration of a game drive is usually 3 hours depending on the amount of time spent stationary while viewing game. Game rangers will halt whenever requested and share their expertise with guests. Game rangers will also stop and allow guests to alight from the vehicle for a steaming cup of coffee which is traditionally enjoyed with rusks (a south African biscuit). On returning from the morning game drive, guests have 30 minutes at their disposal to freshen up before brunch is served. Breakfast/brunch is usually buffet style with a choice of fresh fruit, as well as sweet pastries, toast and jams. Following this, a full cooked breakfast is available. After brunch guests relax at the refreshing pool or enjoy a nap after the excitement of the game drive, depending on their preference. We ensure that guests have enough time to relax and we strive to accommodate every need. Books of an African theme, cards, boardgames such as chess as well as internet facilities are available in the main lodge for guest convenience. Guided by an experienced Ranger on an open Land Rover, Leeuwenbosch Country House offers an experience aimed at providing visitors with an immersion into the diverse wildlife and landscape including: The Big 5, Black Wildebeest, Cheetah, Giraffe, Zebra and numerous other antelope. Easily accessible from Port Elizabeth, Grahamstown and Addo, the Day Safaris run daily. Meet at Leeuwenbosch Country House at 9:30 am for a pre-drive orientation. Depart on game drive at 10:00am. Enjoy a 3 & 1/2 hour game drive around the stunning Amakhala Game Reserve enjoying spectacular views and wildlife. Return to lodge at 13:30pm. After the game drive a delicious two course lunch will be served. R 750 P/P special valid for May - July 2018. R 1080 P/P (2018) (Inclusive of local selected beverages). Children - Children 6 years and older welcome. This 1820 Settler city is only 20 minutes drive from Leeuwenbosch Country House. The city is situated at the center of “Frontier Country” and it takes pride in its cultural and educational heritage. Beautifully restored and preserved historical buildings line the streets and it is here that you will find the 1820 Settlers Monument erected to commemorate contributions made by the British settlers who settled in the area. The Albany Museum is 150 years old and well worth a visit should you enjoy History and Natural Science. The world renowned Grahamstown Rhodes University with its picturesque campus hosts the National Arts Festival in July of every year which attracts visitors from far and wide. Guests will find cinemas, restaurants, craft shops and shopping centres in this charming town. Alexandria is 36 km's away and as such is the closest town to Leeuwenbosch Country House and convenient should guests need to purchase anything the lodge cannot provide during their stay. Guests will find a pharmacy, fuel station and small convenience store located here. The route from Leeuwenbosch Country House to Port Alfred via Grahamstown is a 120 kilometer scenic meander which will take the visitor through the quaint settler village of Bathurst. The historic village houses the area's oldest pub as well as a variety of craft shops. The route will take visitors through the pineapple farming district to the scenic coastal town of Port Alfred. Beautiful beaches make Port Alfred a popular holiday destination both nationally and internationally. Situated on the Kowie river mouth and with a navigable waterway, Port Alfred is popular amongst boating enthusiasts and canoes and boats may be hired here. Alternatively, a game of golf may be enjoyed at the Royal Port Alfred Club and there are also two world-renowned health hydros should visitors require some pampering. Spend the day fishing or antique hunting, or feast on fresh oysters at one of the restaurants on the bay. 25 km's from Port Alfred you will find the seaside village of Kenton-on-Sea which is situated between 2 tidal rivers namely the Kariega and Bushman rivers. Whales are spotted regularly here from April to December. Tours to adjacent Xhosa townships which include a traditional meal in a township home can be organized in advance. Port Elizabeth overlooks Algoa Bay and is known as the “Friendly City”. The city dates back to the arrival by sea of 4000 British settlers in 1820 and the province is also famous for having been the birth place of Nelson Mandela, humanitarian and former president of South Africa. There are many activities on offer in Port Elizabeth including whale watching excursions, historical attractions, craft markets, boutiques and shopping malls, gambling, theatre and live cabaret, pubs, restaurants and late night music spots. Port Elizabeth's Oceanarium, Bayworld, is situated on the beach front and offers live dolphin and seal displays, a snake park and a natural and cultural museum. The rugged coastlines of St Francis, Algoa Bay and Port Alfred hide reefs of incomparable beauty for the diving enthusiast. Shipwrecks, fish and coral may be enjoyed and shark diving excursions may be arranged for the more adventurous. The internationally renowned Humewood, Royal Port Alfred and Fish River Sun golf courses are all within an hours drive from Bukela Game Lodge. Please enquire as to availability of a game at a club well in advance. The Eastern Cape is also rich in Archaeology and Paleontology. During the last century the first Stegosaur Skeleton was documented in South Africa, less than a kilometre from the Amakhala Game Reserve. The Krantz formations along the Bushmans River in the reserve represent a cross section of time extending back 800 million years and there are various interesting fossils, which lie exposed on and around the reserve. 192 page views since 28 Sep, 2018.